After an early buffet breakfast at the hotel, we met our tour guide for the half-day city tour. Our first stop of the day was at the River City Complex and we embarked on a long express motorboat together with some day-trippers. 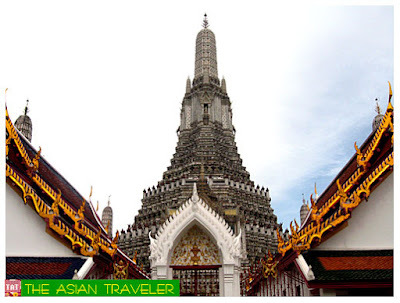 We arrived at Wat Arun also known as The Temple of Dawn, one of the best known Buddhist temples in Bangkok and dates back to the ancient Ayutthaya period. 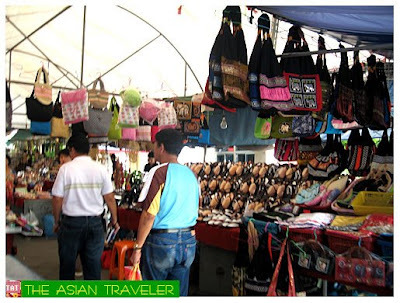 As soon as we disembarked, we passed by through an alley lined with souvenir stalls. 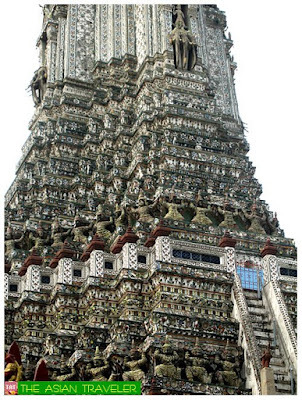 First thing you'll notice of the outstanding Wat Arun is the tall, elongated central Khmer-style tower surrounded by four minor towers, which symbolize Mount Meru, the earthly representation of the thirty three heavens. 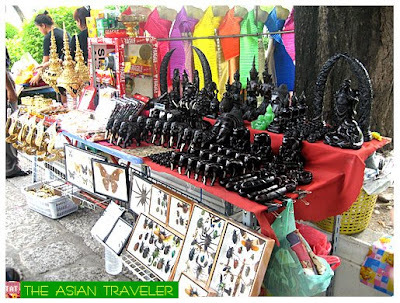 I would say the beautiful architecture and fine craftsmanship of Wat Arun is quite unique and atypical compared to other temples in Bangkok. 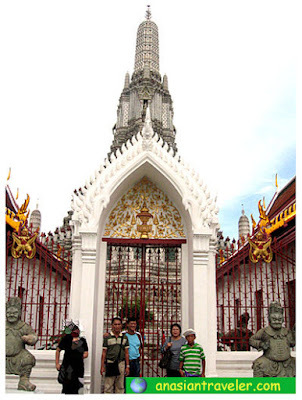 The prang (Khmer-style tower) is described by the Tourism Authority of Thailand as 104m high, while most other sources quote figures around 80-85m. 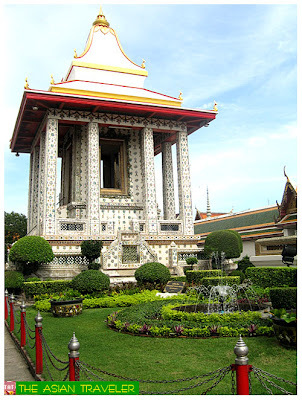 It is decorated by bits of porcelain which had previously been used as ballast by boats coming to Bangkok from China, a hallmark of the reign of King Rama III. Since the stairways are very steep visitors can only climb up to the first level. The second and third levels are prohibited to prevent a future accident. Surrounded by beautiful gardens, the grounds are also pretty pleasing and serene. 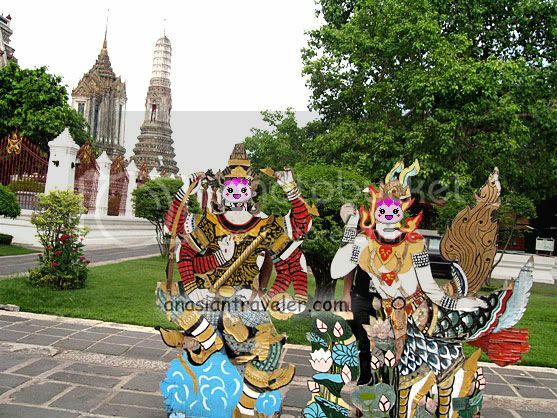 Along the pathway, we saw this three pairs of simple but colorful life-size wooden cutouts of Thai dancers that we were tempted to take some photos. After we poked our heads into the cutouts hole and clicking several shots, unexpectedly a woman who came out of nowhere approached us and asked for 40 Baht each person. Our confused companions paid the said amount. However, when she came to us, hb had a little argument and asserted that there should be a display signage to inform patrons about the fee. The woman pointed the writing on the wooden cutout - "40 B". Believe me, you won't really notice that ridiculous miniature sign unless you are told. To make the story short, we did not pay. It's clearly a big fat scam! 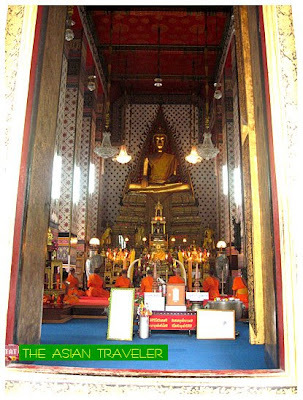 Next to the prangs is the Ordination Hall with Niramitr Buddha image supposedly designed by King Rama II. 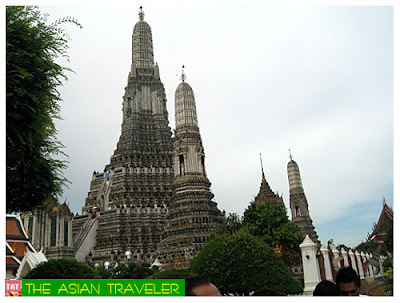 Wat Arun is located in the Bangkok Yai district, on the west bank of Chao Phraya River. It's open daily from 8:30 am to 5:30 pm. 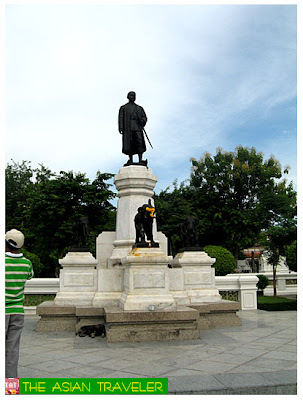 Admission is 30 Baht for foreigners and free for Thai people.